On October 4, 1957 the Soviet Union launched Sputnik 1, the first artificial Earth satellite. This launch was a double blow to the fledgling American rocket program. 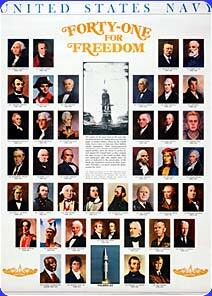 It proved that the Soviets were able to accomplish something that the Americans had yet to do. It also proved that the Soviets had the ability to launch a ballistic missile capable of hitting anywhere in the United States. President Eisenhower and the congress reacted to the Sputnik crisis with vast amounts of money and programs designed to close the gap. One of those programs was the Polaris Program. But for this new solid stage rocket to be effective, it needed a platform. The USS George Washington (SSBN 598) was the world’s first Fleet Ballistic Missile Submarine. It was built by the Electric Boat (EB) Division of the General Dynamic Corporation’s Groton shipyard. The hull of an attack boat currently on the ways at EB was cut in two and a missile compartment capable of carrying 16 nuclear missiles was inserted. The USN had forward-basing arrangements for its Atlantic-based Polaris fleet with both the United Kingdom and Spain permitting the use of bases at the Holy Loch in Scotland (established in 1961) and at Naval Station Rota (Polaris base established 1964) in the Bay of Cadiz. The forward deployment bases were much closer to patrol areas than U.S. East Coast bases, avoiding the necessity for lengthy transit times. In the Pacific, a Polaris base was also established at Guam in 1964. This forward-basing arrangement was continued when Poseidon replaced Polaris, starting in 1972, in what by then were the 31 Atlantic Fleet SSBNs. 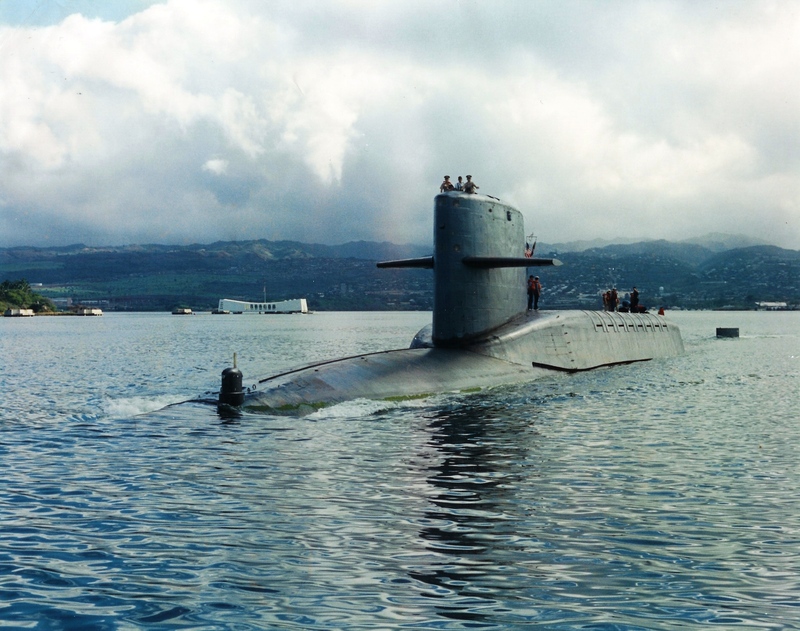 The 10 older SSBNs that could not use Poseidon were assigned to the Pacific Fleet in the 1970s. Polaris was not accurate enough to destroy hardened targets but would have been effective against dispersed surface targets, such as airfields, radar and SAM sites, as well as military and industrial centers of strategic importance. The military authorities, however, regarded Polaris as but one part of a nuclear triad including ICBMs and bombers, each with its own function. The task allotted to Polaris of ‘taking out’ peripheral defenses was well-suited to its characteristics and limitations. The forward deployment strategy required some infrastructure. To allow quick establishment of bases and to minimize the impact on the host country, each base was centered around a submarine tender and a floating drydock, with minimal facilities on shore, mostly family support for the tender’s crew. The first Polaris submarine tender was the USS Proteus (AS-19), a World War II tender that was refitted in 1959-60 with the insertion of a midships missile storage compartment and handling crane. Proteus established each of the three forward deployment bases. Four additional Polaris tenders (USS Hunley (AS-31), USS Holland (AS-32), USS Simon Lake (AS-33), and USS Canopus (AS-34)) were commissioned 1962-65. In Scotland, the USS Los Alamos AFDB7 was erected in a body of water called Holy Loch where she served faithfully until 1991 when the base was deactivated. A two-crew concept was established for SSBNs, combined with forward deployment maximize the time each submarine would spend on patrol. The crews were named Blue and Gold after the US Naval Academy colors. The crews were deployed for 105 days and at their home bases for 95 days, with a 3-day turnover period on each end of the deployed period. Crews were flown from their home bases to and from the forward deployment bases. After taking over the boat, the crew would perform a 30-day refit assisted by the tender, followed by a 70-day deterrent patrol. Sometimes a port visit would be arranged in the middle of the patrol. The home bases for Atlantic Fleet crews were Groton, Connecticut and Charleston, South Carolina. Pacific Fleet crews were based at Naval Base Pearl Harbor, Hawaii. George Washington’s keel was laid down at Electric Boat Division of General Dynamics, Groton, Connecticut on 1 November 1957. 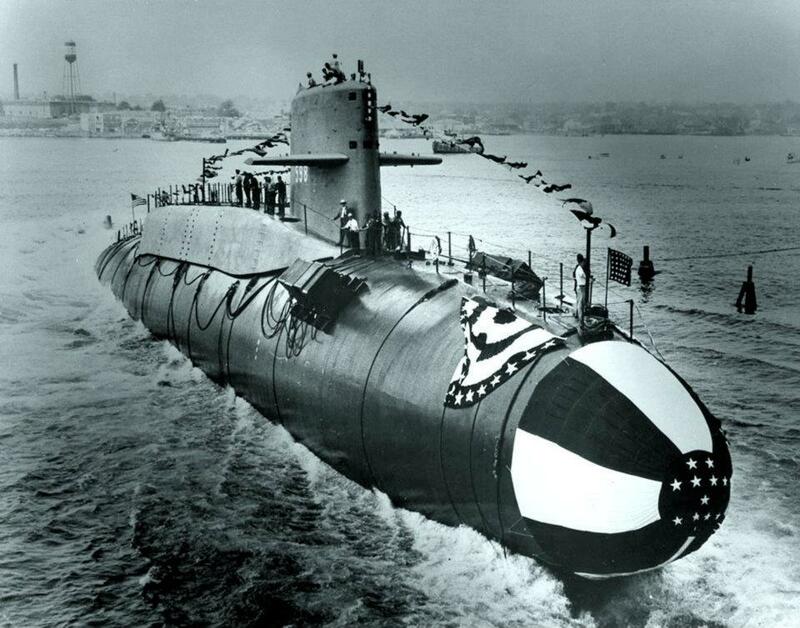 The first of her class, she was launched on 9 June 1959 sponsored by Mrs. Robert B. Anderson, and commissioned on 30 December 1959 as SSBN-598 with Commander James B. Osborn in command of the Blue crew and Commander John L. From, Jr. in command of the Gold crew. 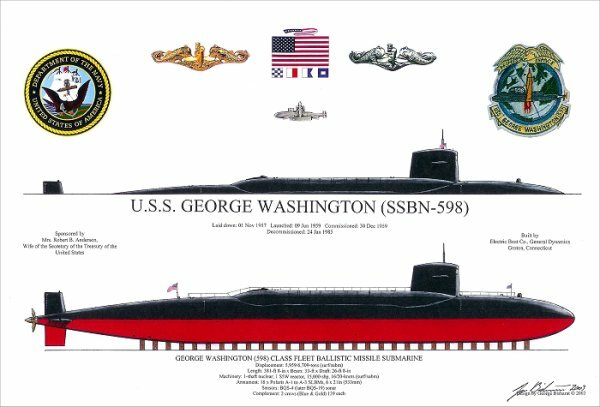 George Washington was originally laid down as the attack submarine USS Scorpion (SSN-589). During construction, she was lengthened by the insertion of a 130 ft (40 m)-long ballistic missile section and renamed George Washington. 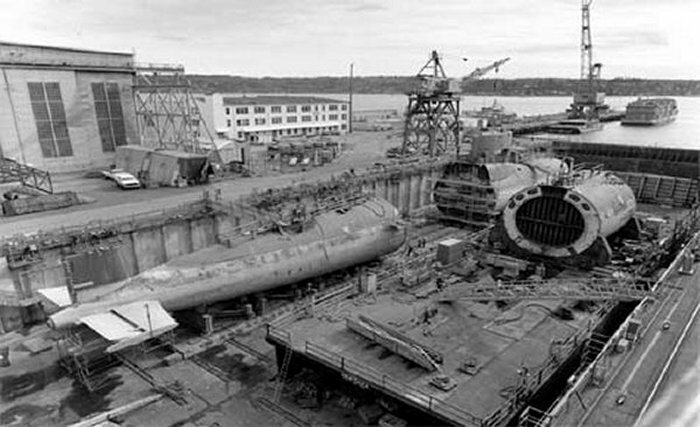 Another submarine under construction at the time received the original name and hull number. Inside George Washington’s forward escape hatch, a plaque remained bearing her original name. Because the ballistic missile compartment design of George Washington would be reused in later ship classes, the section inserted into George Washington was designed with a deeper test depth rating than the rest of the submarine. George Washington left Groton on 28 June 1960 for Cape Canaveral, Florida, where she loaded two Polaris missiles. Standing out into the Atlantic Missile Test Range with Rear Admiral William Raborn, head of the Polaris submarine development program, on board as an observer, she successfully conducted the first Polaris missile launch from a submerged submarine on 20 July 1960. At 12:39, George Washington’s commanding officer sent President Dwight Eisenhower the message: POLARIS – FROM OUT OF THE DEEP TO TARGET. PERFECT. Less than two hours later a second missile from the submarine also struck the impact area 1,100 nmi (1,300 mi; 2,000 km) downrange. George Washington then embarked her Gold crew, and on 30 July 1960 she launched two more missiles while submerged. Shakedown for the Gold crew ended at Groton on 30 August and the boat got underway from that port on 28 October for Naval Weapons Station Charleston, to load her full complement of 16 Polaris missiles. There she was awarded the Navy Unit Commendation, after which her Blue crew took over and embarked on her first deterrent patrol. The submarine completed her first patrol after 66 days of submerged running on 21 January 1961, and put in at Naval Submarine Base New London at New London, Connecticut. The Gold crew took over and departed on her next patrol on 14 February 1961. After the patrol, she entered Holy Loch, Scotland, on 25 April 1961. 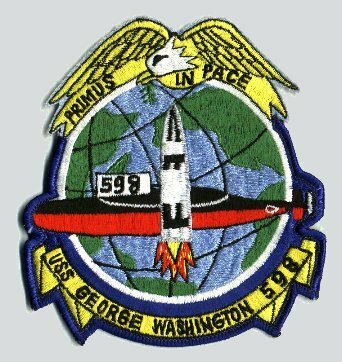 In 1964, four years after her initial departure from Groton, George Washington put in to refuel, having cruised some 100,000 nmi (120,000 mi; 190,000 km). Following refit, George Washington shifted to the United States Pacific Fleet and a new home port at Pearl Harbor, Hawaii. In 1982, George Washington returned to Pearl Harbor from her last missile patrol. In 1983, her missiles were unloaded at Bangor, Washington to comply with the SALT I treaty. 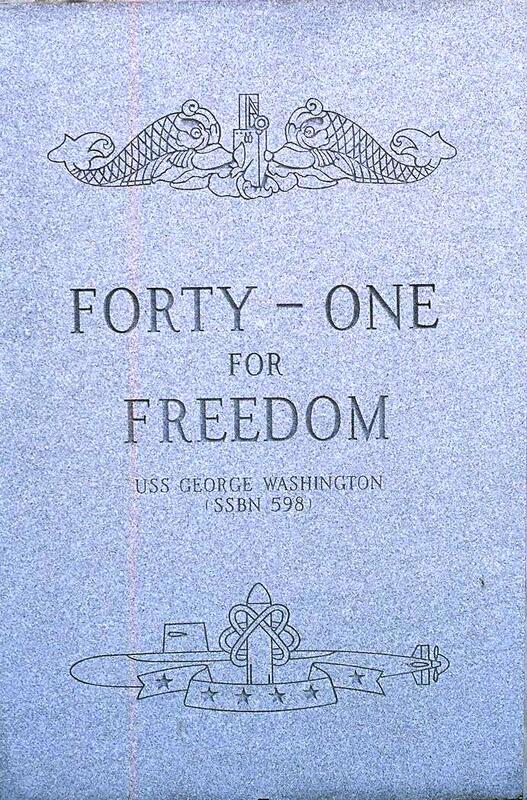 George Washington made 55 deterrent patrols in both the Atlantic and Pacific oceans in her 25-year career. George Washington continued service as an attack submarine (SSN), returning briefly to Pearl Harbor. In 1983, she departed Pearl Harbor for the last time and transited the Panama Canal back to the Atlantic and to New London. George Washington was decommissioned on 24 January 1985, stricken from the Naval Vessel Registry on 30 April 1986, and scheduled for disposal through the Ship-Submarine Recycling Program at Puget Sound Naval Shipyard. Recycling of the ship was completed on 30 September 1998. George Washington’s sail was removed prior to disposal and now resides at the Submarine Force Library and Museum at New London, Connecticut. Complement: Two crews (Blue/Gold) each consisting of 12 officers and 100 enlisted men.